When people visit BMC, they are often in need of medical care to treat an acute health issue ranging from broken limbs to major medical emergencies. We treat illnesses and injuries, but often they are only the most visible manifestation of the care patients really need. For example, a child who comes into the Emergency Department (ED) having an asthma attack can be treated with a nebulizer, but if they live in a house with mold or without proper air conditioning, their asthma symptoms will only become worse. In a case like this, providing an air conditioner will help pediatric patients better manage their asthma, ensuring they can continue to attend school and also avoid unnecessary and costly visits to the ED. BMC has a long history of innovative programs seeking to address social determinants of health—the structural determinants and conditions that can affect health, such as socioeconomic status, employment, housing and social support. Soon, the way the hospital is paid for that care will change, as Massachusetts undertakes a reform of the state’s Medicaid program, MassHealth, to help slow health care costs and improve care for patients. Beginning March 1, as part of this reform, BMC and health systems across the state will begin to care for MassHealth patients under an accountable care organization (ACO) model. Accountable Care Organizations (ACOs), which are increasingly being formed nationwide, are networks of doctors, hospitals, health centers and other medical facilities that collectively care for and manage the care of a group of patients. They are designed to help patients manage their illnesses and reduce health care costs by preventing unnecessary or duplicate tests, and reducing preventable admissions to the hospital and emergency room visits. 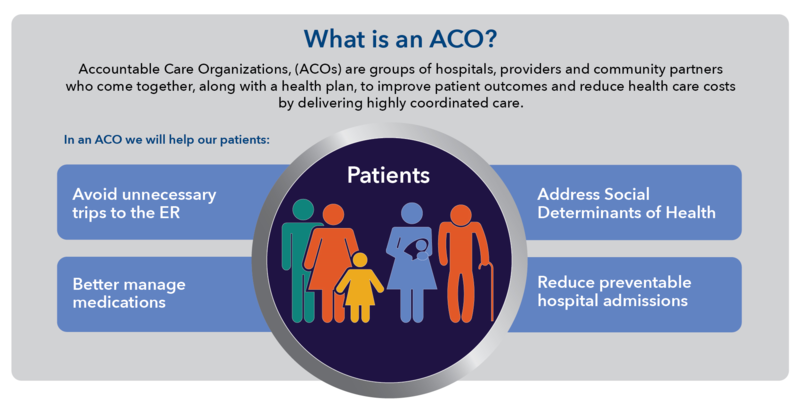 To implement the state’s new ACO model, BMC Health System—which includes BMC, our physician practices and our BMC HealthNet Plan—received approval for its own ACO, Boston Accountable Care Organization (BACO). BMC Health System has also partnered with three other health care organizations—Mercy Medical Center in Springfield, Signature Healthcare in Brockton and Southcoast Health in New Bedford, Fall River and Wareham for participation in the state’s new model. Under the ACO, BMC will receive a fixed amount of money to pay for the care of each MassHealth patient and will be responsible for coordinating everything patients need to stay healthy—both outpatient and inpatient services, as well as community-based services. The result will allow for improved ability to predict patient’s health needs and provide more targeted care. The state’s shift to an ACO model is an acknowledgement that medical care extends beyond hospital and physician walls, a mindset BMC has long championed and been recognized for. From the Food Pantry and Demonstration Kitchen to the Violence Intervention Advocacy Program, BMC has worked tirelessly to stop illness and injury at its root cause, rather than solely providing episodic care. Under an ACO, BMC will be able to even more effectively address social determinants of health and coordinate the care patients need most.